A week ago I published a post on prepositions AT, IN, ON for time. Several students asked me if I could do something like that for prepositions AT, IN, ON but for places. So here you are. There is a mind map graphically explaining the usage of the prepositions and then there are 3 games to practise the grammar point. Enjoy. 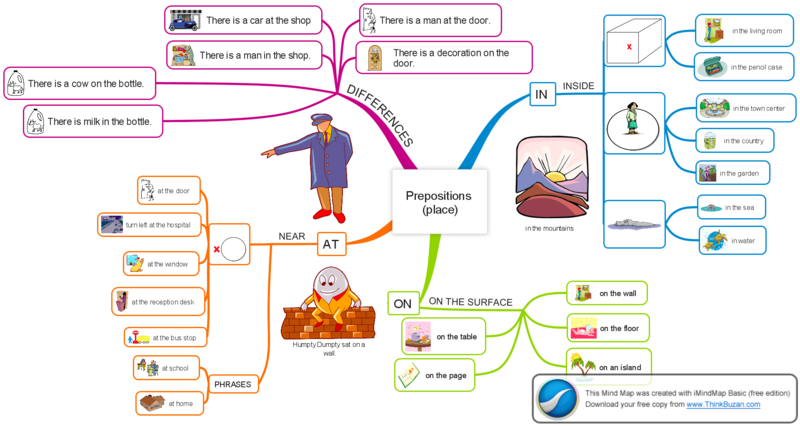 Here is a mind map, where I try to explain the difference between the three prepositions. I tried to make it as illustrative as possible, so I hope everything is clear. Like us to see the mind map. Here you can try three games to practise the grammar point. The first game is called penalty and your task is to choose the correct preposition and then score a goal. Prepositions AT, IN, ON for places – penalty. The second game is called teacher invaders. Your task is to shoot the invaders and every few seconds complete the sentence with the correct preposition. Prepositions AT, IN, ON for places – teacher invaders. Are you looking for something quieter at the end? Try the quiz and if you complete more than 80% of the questions correctly you will get to play the game called Angry Finches. Prepositions AT, IN, ON for places – cloze test and Angry Finches. wonderful mind map. makes learning these confusing prepositions much easier. Many thanks for these excellent resources. I’ll tell my students to play your games. How hard you have been working! Many thanks. Thanks a lot for sharing this with all of us you really recognize what you’re talking about! Bookmarked. Kindly additionally talk over with my site =). We can have a hyperlink exchange agreement between us! Its wonderful as your other blog posts :D, appreciate it for posting. I like your post, cheers. Youre so cool! I dont suppose Ive learn something like this before. So nice to seek out somebody with some unique ideas on this subject. realy thank you for starting this up. this web site is one thing that’s needed on the net, someone with just a little originality. helpful job for bringing something new to the web! Hi. Thanks much for your post. I am still confused when I use these phrases. I am afraid I cannot help you here. Let´s hope a native speaker will react. Sorry.